Daily Illuminator: The Car Wars Arenas Kickstarter Is Ending! 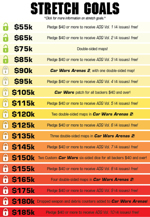 April 28, 2015: The Car Wars Arenas Kickstarter Is Ending! There's only a little while left to back the Kickstarter for Car Wars Arenas; the campaign ends on Wednesday the 29th! We've hit four of our stretch goals already, and we're pretty close to hitting a fifth! One of the great things about that is that, if you back at at least $40, you'll get almost $50 worth of Car Wars PDFs! If you back the Kickstarter at a level that gets PDF, you'll even get Uncle Albert's Catalog From Hell within a week of the project's closing! Oh, and if you're an international backer, check out the Electronic Duellist pledge level, designed specifically for you!